(Nanowerk News) Researchers at Yale University have developed a novel nanoparticle with promising applications in gene therapy, a type of medical treatment that addresses the root causes of diseases now typically treated for symptoms. The advance could lead to new therapies for many forms of cancer, including brain tumors, as well as for cystic fibrosis and Huntington's Disease. 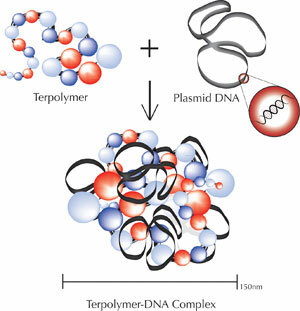 "The systems we developed could be used for any kind of gene therapy," said W. Mark Saltzman, professor and chair of biomedical engineering at Yale and a principal investigator of a paper on these findings, published Dec. 4 online in the journal Nature Materials ("Biodegradable poly(amine-co-ester) terpolymers for targeted gene delivery"). "Using novel chemistry, we synthesized a new family of polymers and produced materials that are unlike any that have been used before." Saltzman and co-principal investigator Zhaozhong Jiang are both with Yale's School of Engineering & Applied Science. Yale researchers have developed a novel nanoparticle with promising applications in gene therapy. The advance could lead to new treatments for many forms of cancer, including brain tumors, as well as for cystic fibrosis and Huntington's Disease. "You can inject a lot of it into animals," said Saltzman. "It produces efficient gene delivery, but doesn't have any toxic effects."